All rigging to be approved by manager. Steel girders run as a grid over full stage and down/downstage on center and 12’5’’ off center right and left stage. Connections made via beam clamp. Ceiling height is 16.5 ft between girders. Weight load extremely limited. Any large load must be hung from existing ground supported truss. Truss is at max load currently and cannot be used. It is supporting video wall. In house control room is upstairs center room (65 feet from downstage end) Touring mix position available downstairs on main floor house left of center (55 feet from downstage end) this mix area must be advanced during the contracting phase as its use affects the venue capacity. One headliner green room backstage with full bathroom including shower private to room use. A second general greenroom with backstage access with private bathroom for all support acts. A unique cafe located adjacent to the Michigan street patio, offering delicious dishes from renowned Chef, Chris Rossi. Cafe, pop-up restaurant, concessions, operator, contributor, producer, Madam Zola’s Fortune is all of these things. We are re-thinking how the culinary arts contribute to events and spaces. 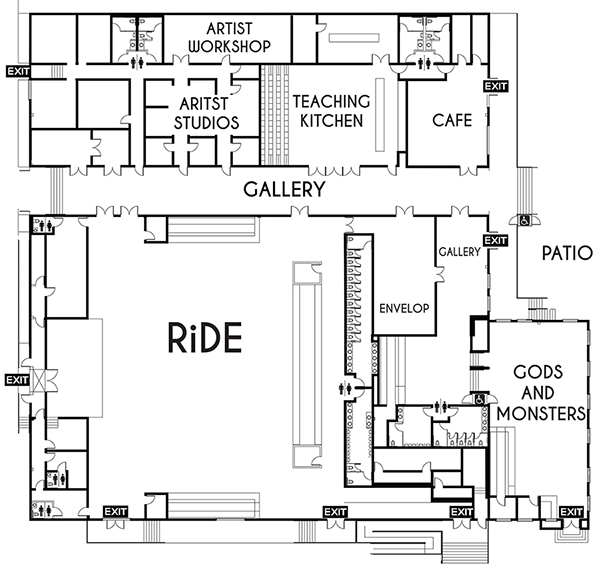 Comprised of two gallery spaces, and a 9-studio artist in residency program, The Midway Art Department providing a unique stage for artists to cross disciplines, expand their process, and create large-scale installations that engage a broad audience.